Mary Glad was born September 16, 1924 in Logan County, Kansas to Roy and Mary Tauscher Bretz. 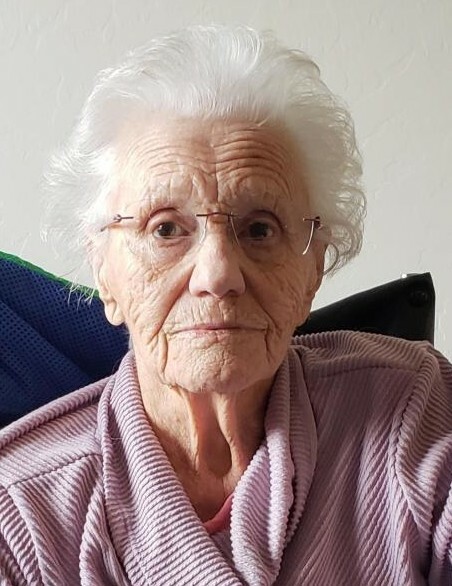 She departed this life on Friday, January 11, 2019 at her residence in The Villas of Green Valley in Green Valley, Arizona. Mary grew up on a farm and ranch in Logan County. She graduated from Winona High School. She attended Fort Hays State College and eventually received her Bachelor of Science Degree. Her teaching career started at a one room school in McAllister, Kansas. She continued her career at the Weskan School, where like many of her fellow single teachers that lived in the old “Teacherage” she met her future husband, Melvin Glad. They were married June 13, 1948 and enjoyed 57 years together. Mary started as a substitution clerk in 1950 at the Weskan Post Office and became Postmaster in 1980. She retired and spent time with Melvin traveling to all the grandchildren events. She is survived by her two daughters, Lennea (Gordon) Tope and Sonja (Dennis) Weeden. Five grandchildren, Allisha (Cory) Weitzel; Jordan (Aubrey) Hanavan; Dustin (Laura) Weeden; Tia (Bill) Duncan; Gabriel (Kristina) Weeden. Two step-grandchildren, Gunnar (Rieko) Tope and Kerry (Melody) Tope. Fifteen great-grandchildren, Adriana, Bryce and Lydia Weeden; Isaac, Josiah and Samuel Weeden; Brody and Mattea Weitzel; Lucy, Henry and Olive Hanavan; Uno and Go Tope; Angie and Caleb Tope. Mary and Melvin always provided unconditional love and support for their family, and she was blessed to live a long life and see the addition of all the great-grandchildren to her family. She is also survived by her brother, Tauscher Bretz and sisters, Lois Ann Siemers and Shirley McKinney. Mary was pre-deceased by her husband, Melvin; grandson, Patrick Weeden; parents, Roy and Mary Bretz; brother, Lindy Bretz; and sister, Roma Boschwitzki. Her last wish was to be buried at sunset on the western Kansas prairie. A celebration of life will be held on Saturday, January 19, 2019 at The Villas in Green Valley, Arizona. A family and friends gathering will be Saturday, January 26, 2019 at 1 p.m. MT at the Weskan Bible Church, Oak Street & School Avenue in Weskan, Kansas. Graveside service will begin at 3 p.m. MT at the Weskan Cemetery, 523 Weskan Avenue in Weskan with interment following at sunset.